It is with a mixture of emotions I sit down to write my tribute to a man who left our lives far too soon. Of course, my first emotion is the sadness and unfairness that “only the good die young.” I am sad for the family loss of a truly wonderful husband and father — such a rarity in our time. We need more men like Don. Then a smile sweeps over my face as I remember Don always smiled. I never heard him complain — even when we shared the challenges of running a veterinary business. At a North American Veterinary Conference almost 30 years ago Don heard me talking about making a bird bread for my breeding hyacinth macaws and asked to have some for his clients. From that day forward he was a loyal client of Harrison’s Bird Foods. Just last week I suggested to Tanya (Harrison) that we contact Don to review his client results with the food. Later we were very pleased when he agreed to abridge the 1394-page Avian Medicine: Principles and Applications textbook to make a softbound version available for broader distribution. 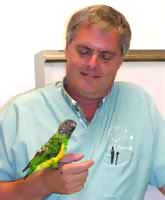 He and Suzanne joined our small touring avian veterinary groups to Costa Rica and Australia, and we all got to spend quality time with them there. Don loved the ocean – sailing, boating and diving. If there is such a thing a fitting end, then to leave this world doing what he loved is just that. I will miss you, Don!